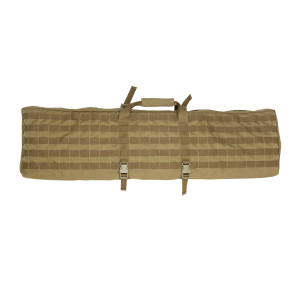 Tactical weapon bag is a necessary element of small equipment, which is useful to the military, hunters, athletes. This is an ideal option for storing weapons in shooting ranges, as well as transporting them to the locations of combat missions. Legislation obliges to transport and carry weapons in public places only in hard cases or soft cases/bags. This need is due to the requirements of physical security and psychological balance of the people around them. But the purchase of high-quality, convenient cover is beneficial for the owner himself. This is a reliable protection of the gun or pistol from accidental mechanical damage, moisture, dust and dirt. 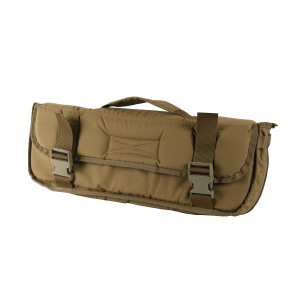 In our online store you can buy bags for weapons of two types • Soft - made of modern, innovative material Cordura 1000 with foam polyethylene inserts. Cordura is a lightweight nylon fabric, the advantages of which are ultra-high strength, resistance to moisture, dirt and mold. Such material will serve many years without loss of the operational characteristics. It does not harden in the cold, it is easy to wash and dries quickly, well exposed to extreme temperatures and sunlight. Due to the presence of 10% cotton in the fabric, Cordura is twice as resistant to abrasion and wear. Using the handle, weapon bags can be easily carried, some models have a shoulder strap. If necessary, an empty bag can be rolled up and put in a backpack, which will require a minimum of free space. • Waterproof - plastic cases for weapons that are made of polyamide. Ideal for transporting weapons without the risk of damage, guarantee perfect protection of sigh systems. Inside the case there is soft foam lining with special grooves for weapons and accessories for care. Cases for weapons attract with the extreme strength of the material, resistance to cold and heat, resistance to water and aggressive chemicals (gasoline, acid, etc.). Special latch bolts securely fasten the case. Hard cases are indispensable for transporting weapons over long distances, providing protection from accidental falls and impacts. The VELMET manufacturing company uses the elite accessories of Italian and Polish production. All our products meet international quality and environmental safety requirements. Store managers are ready to provide free answers to all relevant questions and help with the selection of goods. Here you can buy bags and cases in Ukraine, the price of which is most beneficial - after all, we work without mediators.